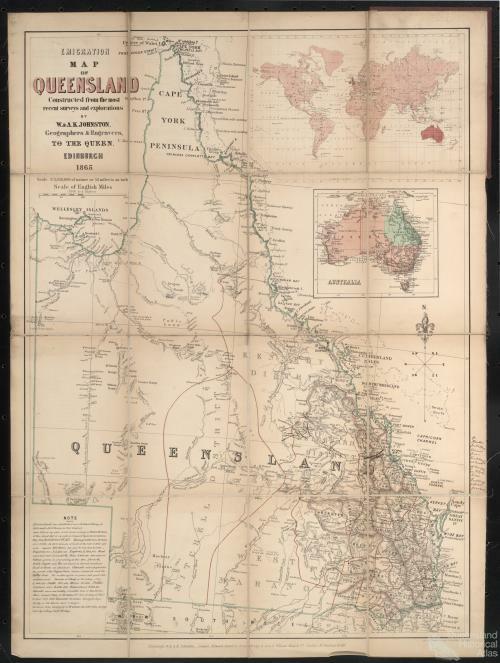 Emigration map of Queensland, constructed from the most recent surveys and explorations by W. & A.K. Johnston, Geographers & Engravers to the Queen, Edinburgh, 1865. The map folds into pocket size, with a hard cover for protection. The world map inset shows the voyage from Edinburgh round the Cape of Good Hope through Bass Strait and up the east coast to Brisbane. The second inset map shows Australia with Queensland in green. The likely emigrant using this map may have been headed for Rockhampton, and then by rail and road to the gold diggings near Peak Downs. Hand annotations note the railway west and road to the diggings and the margin notes the “Harbour for shipping steamers from Rockhampton at head of navigation on Fitzroy River. Rockhampton population 7000 souls.” The map includes the paths of explorers Leichhardt, McKinlay, Burke, Wills, King & Grey, Landsborough, and Sturt and includes some of their observations such as ‘Low sand hills & black soil plains’.